Revlon's spring release of the Bloom With Captivating Color for Spring has two nail polish sets. The set that I got was the Tea Party Set (Butterfly, Moss and Tulip) which has the warmer tones, and the other one was the Garden Party Set (Waterfall, Sparkle, Garden) which contains the cooler tones. Each set has a dainty, bold, and fun color just screaming spring and summer! The nailpolish bottles are a decent size considering they're a 'mini' set. Each nail polish contains about half of what you get in a regular Essie or O.P.I nail polish, and the bottles on this set is definitely bigger than a mini sized Essie or O.P.I nail polish. The nail polish brush is pretty stiff enough that it gave me a pretty good control on my application, however its shape made it a tad difficult to get into the smaller area since the brush head was pretty thick. Out of this set, as bright as it looks, I really like Butterfly, especially on my toes. It's a bright and really bold color. It just really screams summer in a bottle. I like it on my toes that it can be a little distracting. The Moss shade is a pretty moss green which is also a work-friendly shade. Tulip almost reminds of O.P.I I'm Indi-a Mood for Love and NYX Cosmetics' Hot Pink lipstick (if it were a lipstick color). Tulip is a more bolder pink compared to I'm Indi-a Mood for Love. 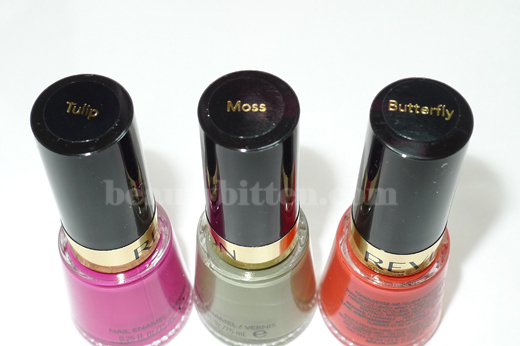 As far as the formula goes, the nail polish can be a little streaky sometimes, and at one point becomes goopy. 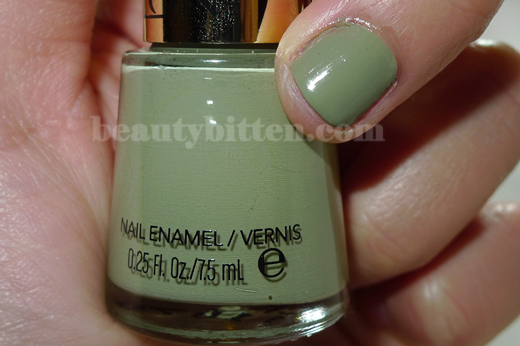 Moss green was the only one that I didn't experience any streakiness since the nail polish was creamy. Final Thoughts: Overall, this set is going to get you ready for spring and summer. And for its price point of $7.99 for three nail polish, it's almost too hard to pass up. And to sweeten the deal, Walgreens has a Buy One Get 50% off on Revlon cosmetics up until May 7, 2011. This post contains a gift from a friend. Please refer to my Disclaimer section for more information.